Not considered dangerous to humans. Enlarged non-grooved teeth in the rear of the upper jaw and mild venom which may help to incapacitate small prey. Prairie ringneck snake (Diadophis punctatus arnyi), a species of Special Concern, prefer to live in a variety of open or partially open canopy settings including bluff prairies, open rocky road cuts (usually southerly exposed), old fields with rocky structure at the surface or along railroad grades where access to underground retreats and overwintering habitat is suitable. The Northern ringneck snake has a body color from bluish grey to black, with a complete narrow yellow or orange ring around its neck and an underside matching the ring and generally lacking any dark spotting or patterning. Mildly Venomous Not considered dangerous to humans. Enlarged non-grooved teeth in the rear of the upper jaw and mild venom which may help to incapacitate small prey. Not considered dangerous to humans. With enlarged non-grooved teeth in the rear of the upper jaw and mild venom which may help to incapacitate small prey. Texas Indigo Snakes range from south Texas to Mexico. 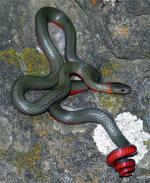 They are often found in grasslands, sparsely wooded forests and scrub lands. They are usually found close to water sources such as ponds, and cattle troughs. 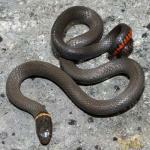 Indigo Snakes are black to dark blue in color, with an iridescence shine to their scales.